Vietnam Discovery Tour is one of the most fascinating tours to explore unique culture in Vietnam. 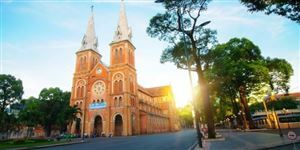 You will visit many famous destinations in Ho Chi Minh City such as War Crime Museum, Thien Hau Temple, China Town, City Hall… and Cao Dai Temple, Cu Chi Tunnels. It’s appropriate for all tourists who get deeply knowledge about cultural and religion values in Vietnam. 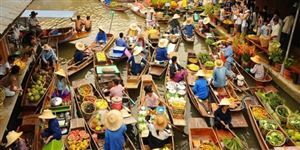 Moreover, you can visit Cai Be floating market and traditional villages in Mekong Delta. Let’s contact Blue Ocean Travel to get surprising information from this trip. - Take a flight to Saigon. Welcome by our local tour guide & Then transfer to city center. Enjoy your dinner on Cruise driving around Saigon river. Contemplate sparkling Saigon at night & join eventful music show on cruise. - Breakfast at hotel. 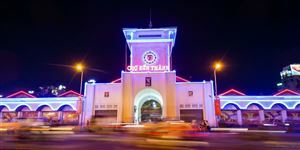 We will enjoy Ho Chi Minh city tour, the formerly known as Saigon, is the largest and busiest city in Vietnam. We will visit Reunification Hall which was the residence of the President of the former South Vietnam until 1975, the Notre Dame Cathedral (built in 1877), General Post Office, War Crime Museum, China town and Ben Thanh market. 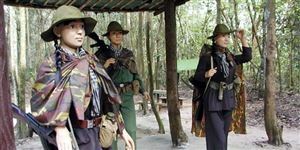 - In the afternoon, we have an excursion to the famous Cu Chi tunnels. This network of tunnels, which stretched for over 200km, became legendary during the U.S -Vietnam War in the 1960s. - Breakfast at hotel. Free until the coach pick you up to Tan Son Nhat airport for the flight back . End of the trip.